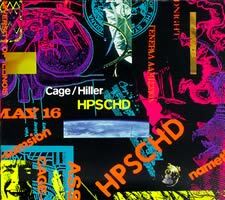 John CAGE / Lejaren HILLER: HPSCHD (1967-69). Realization by Joel Chadabe and Robert Conant (harpsichords). EMF CD 038 (http://www.emfmedia.org/). Distributed by CDeMUSIC (http://www.cdemusic.org/). Diehard Cage devotees won’t need me or anyone else to sing this new realization’s praises. We’ve already made a beeline to snap up a first copy. There is no booklet; you get 15 CD-sized cards. Arrange them to see the fluorescently bright recreation of an original concert poster advertising HPSCHD’s May 16, 1969 first performance. Turn them over for exceptionally detailed notes and essays, several written by premiere participants. (One fellow seems to have made the easy mistake of swapping the 16th for the 19th.) After the first edition is sold out, EMF intends a standard CD issue. Folks who sample HPSCHD and like it (some Cage fans will be flabbergasted) might be recalling personal involvement in a comparable event. That’s what keeps me going. I once played harpsichord in a similar happening, an extravaganza with dancers, videos, and extensive amplification. A huge magnet rocking atop a TV and distorting its picture was a neat toy for the strolling audience. The noise was so dense it felt like fog rolling around our ankles. My harpsichord was completely inaudible, even to me. That was one of the few times I’ve felt a physical component to sound. Cage doubters will find their worst fears confirmed in one convenient Day-Glo package. HPSCHD’s zillions of harpsichords commingled with gazillions of bleepy sine waves are a potent onslaught. Your age, stomach contents, and proximity to mind-altering substances will determine whether you find this maddening, nauseating or exhilarating. Lasting over an hour, Chadabe and Conant’s realization spans seven tracks, supplemented with two additional demonstrating the cacophony’s individual components. Nonesuch’s classic LP HPSCHD release included a computer-generated instruction sheet which encouraged the home listener to take part in the performance by twiddling playback controls. Jumping into the CD’s spirit, I’ll always start at track three. 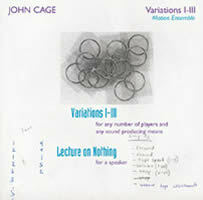 John CAGE: Variations I (1958); Variations II (1961) with Lecture on Nothing (1959); Variations III (1962-63). Motion Ensemble. mode 129 (http://www.mode.com/). Mode’s 29th volume in its ongoing Cage traversal presents the Variations series’ first three installments. Motion Ensemble emphasizes a technological progression with acoustic instruments in Variations I to live electronics in Variations III. David Tudor’s spirit hovers over these performances. He’s Variations I’s dedicatee: “for David Tudor, on His Birthday (Tardily),” and several Motion Ensemble players cut their signal-processing teeth (sawteeth?) on Tudor’s live electronic works. Variations I, taken here by clarinet, horn, trumpet, violin, double bass, prepared piano and percussion, sounds like any of the unstructured aleatoric pieces cluttering the 20th century. However, Motion Ensemble’s musicians play reservedly, producing ample savory sounds. Variations II introduces electronics and a simultaneous performance of Lecture on Nothing. Helen Pridmore delivers the odd, self-referential text as much about nothing as it is about something. Several times she burbles the words through water or projects them in a laughing voice. Double bass and violin squawks and scritches are amplified. A percussionist plays with gadgets ranging from toy pianos to amplified slinky. It’s entrancing to follow the text’s thread, and as in the other performances, Motion Ensemble proceeds with delicate restraint. Variations III includes pre-recorded and live sounds: twittering birds, a revving gas-powered lawn mower, a bus pulling up to a curb, etc. The live electronics aren’t heavy-handed. These aren’t DJs using Cage’s shadow as an excuse to bring down the house. Many quiet sounds are amplified, and countless percussion and widgets are treated to filtering, reverb and delay. Instruments and techniques may differ from Variations I, but the atmosphere is similar. Heard coming after Variations I and II, a listener might not notice that traditional instruments are absent. It’d be a treat to hear these folks live. True to form, mode presents an excellent recording, capturing these caucuses’ every nuance. 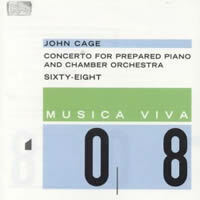 John CAGE: Concerto for Prepared Piano and Chamber Orchestra (1951); Sixty-Eight (1992). Róbert Regös (piano), Symphonieorchester des Bayerischen Rundfunks, Lucas Vis (cond.). col legno WWE 1CD 20088 (http://www.col-legno.de/). Distributed in the US by Qualiton (http://www.qualiton.com/). On the eighth disc in col legno’s Musica Viva series, the Symphonieorchester des Bayerischen Rundfunks imparts an unexpected Webern-like fragility to this delightful pairing of two contrasting Cage compositions. The Concerto is unwrapped like a delicate glass flower arrangement, Róbert Regös infusing an unexpected softness to the prepared piano’s clunks and taps. While Stephen Drury’s excellent rendition on mode 57 dramatizes the work’s angularity and shock value, Regös and Vis’ detachedness modernize the Concerto, though the infrequent radio bursts and amplified slinky reaffirm its mid-century roots. Similarly, this Sixty-Eight offers a contrast to Lucas Vis’ earlier recording with the Radio-Sinfonie-Orchester Frankfurt (hat ART CD 6168). The col legno issue is reflective whereas hat’s 1992 teeth-baring performance is defiant (although the paired Quartets I – VIII is incredibly tender). I cannot listen to Sixty-Eight without realizing that this work caps Cage’s last year and his final stylistic breakthrough. I hear grief and anguish in Vis’ first recording and acceptance in his second. An orchestra corresponding in size to the title’s number progresses gradually through 15 pitches, a deliberately straightforward Scelsi-like series of shaded unisons, spiced with the odd percussion that only Cage could invite (bird calls, chains, pouring water). Experienced Vis and the Bayerischen Rundfunk present Cage is if he were Mozart, an appealing approach. Steve REICH: Music for 18 Musicians (1974-76). Amadinda Percussion Group & Musicians. Hungaroton HCD 32208 (http://www.hungaroton.hu/). Distributed in the US by Qualiton (http://www.qualiton.com/). David BORDEN: The Continuing Story of Counterpoint: Part One (1976), Part Three (1976); C-A-G-E, Part III (1975). 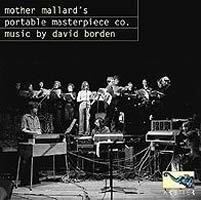 Mother Mallard’s Portable Masterpiece Co. Arbiter Records 136 (http://www.arbiterrecords.com/). Distributed in the US by Qualiton (http://www.qualiton.com/). 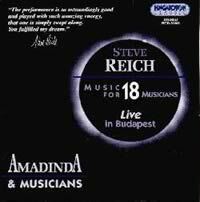 Steve Reich’s endorsement sums it up perfectly: “The performance is so astoundingly good and played with such amazing energy, that one is simply swept along.” Exceeding an hour by a minute and nine seconds, four Amadinda Percussionists and friends from Group 180 whose names have appeared here before (László Melis, Béla Faragó) trot brightly through Reich’s extended minimalist landscape. Recorded live in 1990, Music for 18 Musicians blends pitched percussion (marimbas, vibraphone, xylophone) with four soprano voices, violin, cello, clarinets doubling bass clarinets, and pianos. Some players double on maracas. At many places instruments will drop out, revealing a new texture. Often the voices, pitched percussion and strings will create ethereal combinations. The ensemble’s balance and timing are perfect. Their joy and excitement are so palpable that listening becomes a pleasure. In several places, the players are instructed to repeat a note as long as their breath allows. One such area occurs at the beginning where the low clarinets create wonderful shapes. Moving from flesh and blood to patch cables and analog circuitry, David Borden was the first to tour with Robert Moog’s synthesizers. This disc, out of place on Arbiter’s usual menu, presents performances taped in 1976 and ’77 when early synthesizers could play only one note at a time, with chords and textures having to be created through electronic effects. Borden’s figurations are rapid and tricky with constant meter changes and accents. Complex patterns derived from a detailed study of traditional counterpoint tumble gaily and incessantly. These performances reveal astounding technical and keyboard virtuosity. It’s wonderful that we have them. Borden’s excellent notes document early Moog history, its first music, and life on the road. 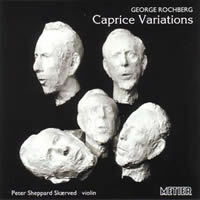 George ROCHBERG: Caprice Variations (1970). Peter Sheppard Skærved (violin). Metier CD92065 (http://www.metierrecords.co.uk/). Rochberg and Skærved unleash an avalanche of questions. Did Rochberg write Caprice Variations for the solo violinist to study and play alone, to savor countless allusions from Bach to Ysaÿe, via Brahms, Beethoven, Webern, Kriesler, and Rochberg himself? Some quotations are explicit. Many are beyond the violin’s repertoire such as those concocted from Brahms’ Paganini Variations for piano. Mahler makes an inevitable appearance. The opening of Rochberg’s Third String Quartet (not completed until three years later) spikes the 18th variation, startling even those who know this American composer’s music and what he stands for. How can an audience endure 50 variations (plus paraphrase) on the theme of Paganini’s 24th caprice? In a concert the whole series must be excruciatingly difficult to grasp. Imagine legions of fumbling concertgoers, their noses buried in program notes, pages shuffling constantly. Even the armchair listener is not immune. Skærved’s notes are detailed, describing most of the variations and the composer’s impressions upon hearing him play. Even with the booklet spread open and constant glances at the track counter, it’s easy to get lost. Is the violinist, live, meant to tackle all 90 minutes in a single go? Right off the top, I have to say that Skærved sounds amazing. He’s playing the 1734 Habeneck Strad. Kudos to Metier’s David Lefeber for capturing the instrument and Skærved’s passionate playing. Skærved took two recording sessions. A single sitting would have been reckless, but might have captured the physical challenges. Skærved has actually programmed the whole expanse. His recollection suggests it was an intense and exhausting experience bordering on the religious. Gidon Kremer recorded a batch of 23 variations plus the theme (DG 415 484-2), and others have dipped into this monumental set: Michelle Makarski tried a few on ECM 1587 and ECM 1712, and Zvi Zeitlin tackled the whole shebang for Gasparo 1010. Several variations come off roughly, such as No. 41, allegedly a Webern take-off. Maybe the Strad doesn’t like Webern. Paganini’s original appears at the end, absent customary repeats. The cycle closes abruptly, perhaps too late for many. Yet, this music could continue interminably. I’ve played it in the background, catching whiffs of Tchaikovsky or Dvorak as if Skærved and Rochberg are channeling composer’s scraps. These variations-on-variations have grown on me and it’s a treat to hear a Strad sound so good. It’s reassuring knowing that Skærved has tilted at windmills and won. I also picture “Uncle George” sitting in a rocker, spinning the same tales over and over, but with slight modifications at each go. The work’s appeal has grown on others: Eliot Fisk labored closely with Rochberg to transcribe the mammoth set for guitar (MusicMasters 67133-2). 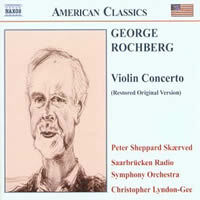 George ROCHBERG: Concerto for Violin and Orchestra (1974; restored orig. vers. 2001). Peter Sheppard Skærved (violin); Saarbrücken Radio Symphony Orchestra, Christopher Lyndon-Gee (cond.). Naxos 8.559129 (http://www.naxos.com/). Rochberg’s Violin Concerto pins early 20th-century Romanticism in a great big bear hug that never lets go. Catch it unannounced over the radio and you’ll tag it as a product of war-torn Europe. (In fact, Rochberg did serve in the Army.) Rochberg prefers Korngold’s coy glamour over Berg’s fin-de-siècle angst. He never dips into his bag of polystylistic tricks, retreats into serialism or goes dissonant. Meaty low brass provides deep rich hues. The concerto is taut and introspective, like current films that are shot in black and white, where all the men wear ties and are painfully polite. Whatever you think of Rochberg, he is an excellent technician, for which he must be highly commended. The Violin Concerto’s stylistic uniformity contrasts completely with the 1995 Concerto for Clarinet and Orchestra (just released on Bravo 20125), performed by its dedicatee Anthony Gigliotti and the Taipei Symphony Orchestra under Felix Chiu-Sen Chen. Attending to this wind showpiece is like passing through a foreign land and trying to make sense of the billboards. Fleeting Berg, Berlioz, Mozart and Sibelius snippets will scroll by, but you’ll wonder if that’s what they really were. Rochberg’s Clarinet Concerto is paired with Dominick Argento’s harmless Capriccio for Clarinet and Orchestra, “Rossini in Paris.” Now if only some clarinetist would match Rochberg’s concerto with Lachenmann’s Accanto. The Violin Concerto’s five movements are Introduction, Intermezzo A, Fantasia, Intermezzo B, Epilogue. The second intermezzo is the longest movement, a bittersweet rhapsody at sunset. The five-movement sweep is definitely grand, progressing from defiance into autumnal despair. Skærved, Lyndon-Gee and the Saarbrücken Radio Symphony Orchestra give their best. Skærved is an awesome soloist, inhabiting this concerto like a wandering spirit come home. Rochberg fans will continue to be puzzled, but wary “modern music” listeners willing to experiment will be rewarded. “Compositions for Piano (1920-1952).” Stefan WOLPE: Sonata No. 1, “Stehende Musik” (1925); Adagio, “Gesang, weil ich etwas teures verlassen muss” (1920); Tango (1927); The Good Spirit of a Right Cause (1942); Battle Piece (1943-47); Waltz for Merle (1952); Zemach Suite (1939). David Holzman (piano). Bridge 9116 (http://www.bridgerecords.com/). 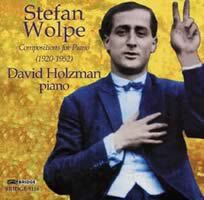 David Holzman’s densely packed disc of Stefan Wolpe’s piano music is a shot in the arm. Arthur Berger (who shares New World Records 80308 with Wolpe) once lamented that the feisty German-born composer never found the audience he deserved. Wolpe demands energetic passion and forthrightness, a rare combination in the 20th-century landscape. Imagine Hindemith’s mature technique applied with gusto and abandon, hyperactive extensions of the fast, “lebhaft,” movements of the Second and Third Piano Sonatas. Bridge unveils several pieces in first recordings: a scathingly short deconstruction of the archetype Viennese waltz, Waltz for Merle; the Ivesian The Good Spirit of a Right Cause; and the brutally experimental Sonata No. 1, “Stehende Musik,” where motor-rhythmic outer movements sandwich a lyrically tonal slow one. Wolpe’s great talent was to synthesize passing trends, be they jazz, futurism, expressionism or serialism to illustrate his beliefs or cannibalize them to reveal their inherent absurdity. Even the tiny Tango curls its toes. Many works are downright ferocious. In a detailed essay Holzman describes wrestling with Battle Piece whose full name here is the cumbersome “Encouragements for Piano. First Piece. Battle Piece.” Begun as a response to WWII, Battle Piece was completed for his wife’s piano student, David Tudor. The seven barbed movements traverse the piano’s range and moods. The instrument absorbs great wear here and elsewhere. At the 3:46 mark in the vigorous second movement (Molto Sostenuto), we hear what sounds like a hotel bell ringing, probably a hammer briefly touching a vibrating string. The disc closes with the seven-movement Zemach Suite, an intricate composition melding Middle-Eastern melodies with European pitch organization and harmonic structure. Holzman dispatches each and all with great flair and devotion. In the booklet he recounts his first experiences with Wolpe as teacher and his growing admiration for the man’s music. Ordinarily I’m wary of industry acclaim, but this disc clinched a 2003 Grammy nomination. You should get in on it.